Kerry Martin Pool Builders, Inc., Author at Kerry Martin Pool Builders, Inc. 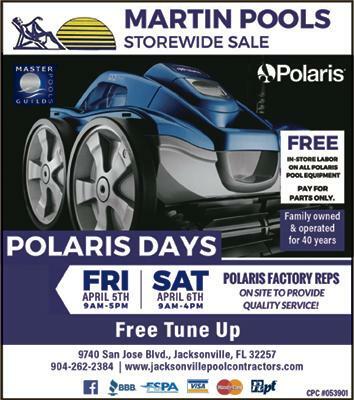 Author: Kerry Martin Pool Builders, Inc.
Kerry Martin Pool Builders, Inc.
Our retail staff will be accompanied by the Manufactures Reps. from Zodiac to give a unbias, friendly evaluation of your machine. All the ways you as the homeowner are able to improve the life of your existing cleaner. Their goal is to increase the efficiency and ease of your Polaris cleaner. At the same time we will be holding sales on each type of Polaris model including the new quattro pressure style cleaner. This event will be held at our beautiful showroom on the 5-6th of April with extended hours to not leave any of our valued customers out. 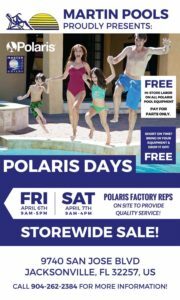 Like most of the Polaris days Sales will be on Cleaners However this year we are extending the sales to include Pumps, Filters, Heaters and lots more store items. Kerry Martin Pool Builders Inc.
A Storm Is on Its Way. Have you Prepared Your Pool? Hurricane season is upon us—let’s be prepared! Check out the tips below from NSPF partner Florida Swimming Pool Association (FSPA). Also visit their page here. If you’d like to learn more about preparing for a hurricane, check out the American Red Cross Hurrican Preparedness page. Should I Drain my Pool? No! Keeping sufficient water levels in your pool provides the needed weight to hold the sides and bottom in place during the storm. This is especially important as the heavy rains begin to fall; heavy rains will raise the local weather table which can cause unfortunate problems. Pools that have been emptied may experience serious subsidence problems and could even be lifted out of their foundation. Should I Lower the Water Level in my Pool? Is your pool properly equipped with adequate drains and skimmers while the surrounding area is properly drained? If so, then the water level is probably fine and can be left as is. If you have surrounding structures that can be damaged by water that cannot run off naturally, then experts suggest lowering the pool’s water level by one – two feet. Should I do Anything To the Pool’s Water Chemistry? Yes! It is recommended that you super-chlorinate your pool water. “Shock” the pool in your typical manner. Should I Leave My Automatic Equipment and Electrical Systems Turned on?Of course not! It is INCREDIBLY important that all electrical power be turned off at the circuit breakers before the storm hits. Any and all exposed electrical equipment, such as, but not limited to, motors for the pumps, should be tightly covered with plastic wrap. If you believe there will be flooding in this area, you should disconnect and remove them. Should I Take Any Special Precautions with my Decking and Screens? Creating a “vent” in your frame of an enclosed screen structure can provide relief and avoid some damage. Panels in screens can be removed on either side of the pool area. Doors that are especially vulnerable, might be completely removed. Should I Throw My Pool Furniture into the Pool? No…. 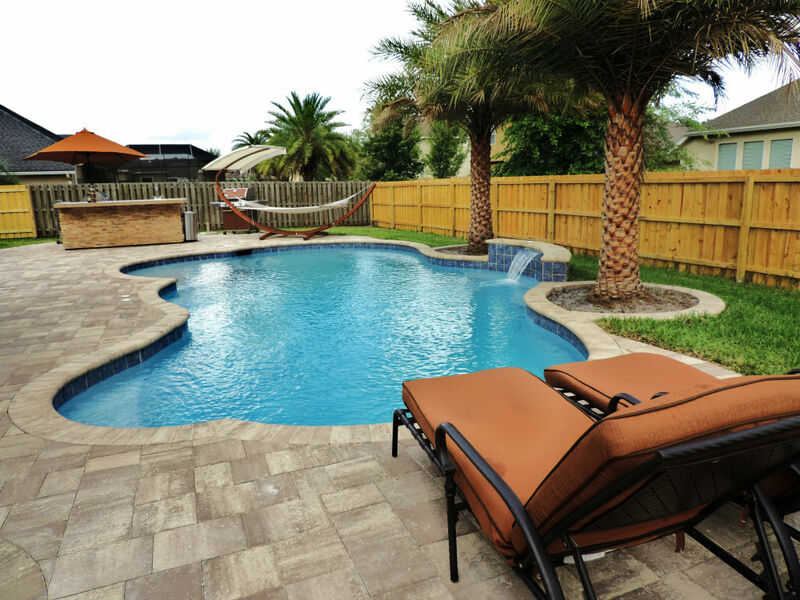 but the key word is “throw.” You should never throw or drop anything into a pool that could damage the pool walls or bottom, especially if the pool is vinyl-lined or fiberglass. It is best to remove any and all loose objects, such as chairs, tables, pool equipment, and even toys, which can become dangerous in high winds. Be very careful in doing so, and remember that pool chemicals can damage the items. This is not recommended. Should Commercial Pool Facilities Take Any Additional Special Precautions? Stored chemicals should be removed to a safe, high, and dry location. Remember that some chemicals when mixed can produce dangerous gasses; others, if wetted, can cause fires. Sump pits should be cleaned and checked. A portable gasoline operated pump is helpful if power is not restored quickly. Pools near apartment units/motel rooms should have water levels lowered by one-two feet if potential flooding is a factor. Remove all loose items around the pool area, including trash cans, ashtrays, nets, etc. Equipment covers should be secured by being latched or bolted down.